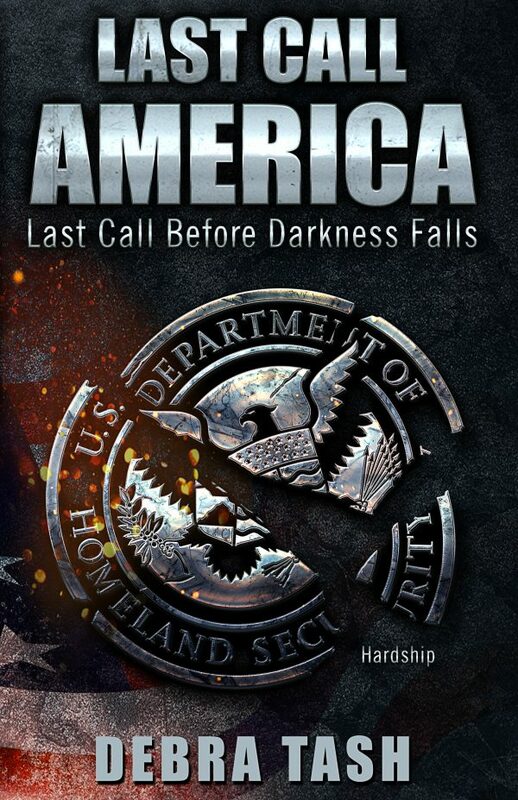 Last Call America: Last Call Before Darkness, a new release by Debra Tash is an intense, cautionary tale written in the tradition of critically acclaimed novels, Fahrenheit 451 and 1984. Set not too far in the future, but far enough to give perspective, the reader is dropped into an America that is familiar with one big exception; personal freedom no longer exists. However, unlike the works of Bradbury and Orwell, where the extinction of the ‘big bad powers that be’ are the main objective, it is uncertain what will be gained from toppling the totalitarian regime in Last Call. Food rationing and martial law will surely be eradicated. Yet, the bigger national crisis remains; the unity of a country has been destroyed by divisive politics. Propaganda is deemed truth and the malaise of a population is the belief that their elected government is working to their benefit and equality. Along with that, the Department of Homeland Security (DHS) has a pass to use extreme prejudice in dealing with any subversive laying claim to First and Second Amendment Rights. Tash’s ability to craft imagery and palpable tension is compelling, but not so weighted down with dystopia that the reader is unable to recognize the remnants of what was once the home of the free and the brave. The book’s main character, Rebecca Sanders ‘Beck’ tells her story in first person. A Harvard drop out who now runs a diner with her half-sister, Christina, Beck has a smart mouth and a flawed character. Her resolve has been jaded by the need to survive. Her hero instincts are dormant because she has seen firsthand that in her world the power of one is really the power of none. Yet, the glimpses of her deeper belief in liberty revealed first through oppression then sacrifice are irresistible to the reader. Through her eyes and transparency of emotion, one is at once compassionate and unnerved by the government’s debauchery of U. S. Constitution as well as Beck’s personal identity. More than not knowing who to trust, Beck does not want to trust anyone. When she meets Jason Poole, a soldier enlisted to enforce martial law in her town, her hatred of him and what he represents is unadulterated. She finds him to be a bombastic misogynist. Yet, despite her inclination to shoot him where he stands, she eventually empathizes and even relates to his personal conflict. Sanders and Poole are rebel stars cut from a setting sun. With little time left before a global crisis forces them into starvation and total subservience, their wartime love story works as a device to give them purpose in a world with nothing left to lose. Along with Beck’s sister, Christina, and Poole’s sergeant, David Hernandez, they launch an uprising. A full-on gladiator fight to restore the United States to a democratic republic ensues. However, they soon find out that the battle is deadlier than they could have possibly imagined when a weapon of mass destruction is revealed. Along the way, Beck is reunited with her estranged mother, Maggie, a former DHS operative. Although it is a life or death situation when they meet, Beck’s resentments for this woman still run deep. Maggie had abandoned their family when Beck was just a child. Yet, there is redemption when it comes to light that a greater more selfless good was served by Maggie’s actions. Still, even her mother’s genius cannot surmount the stronghold of totalitarianism and nukes faced by Beck, Poole and a few thousand freedom fighters going up against America’s military industrial machine. At this point, it is all out war. No turning back. The action and tension are ramped up. With little gain from their sacrifices and still no real answer as to how to liberate their country, Beck’s humanity shines through. The call to action has transformed her from cynic to freedom fighter, and the reader finds in her a steadfast reason to go on. When the final ordeal in the novel begins everything is at stake; life, love, liberty and the fate of America and its people. The author displays an amazing grasp of futuristic technology and modern day killing machines that is both frightening and entirely plausible. Tash’s agility as a wordsmith is evident in her ability to switch between prose-like imagery and gut-wrenching action without losing the reader. The dialogue is realistic and works to drive the plot forward while giving insight into character motivation. Last Call Americaproves to be an exhilarating work of literary fiction and a wild ride worth reading! Katie Cocquyt is an award winning novelist and freelance journalist. Ms. Cocquyt has also worked in the film industry as a screenwriter and has won numerous awards for her screenplays She and her daughter are both equestrians and live in Moorpark.